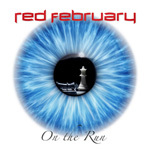 Boasting an international cast of characters, including German guitarist Markus Spohn and Australian vocalist and songwriter Marcus Cappellazzo, Red Febraury is a new modern rock band from San Fransisco. On The Run is their debut album. The band has a common 21st century post-grunge melodic hard/heavy rock sound, complete with modestly d-tuned guitars. Yet their music is flowing with melody and harmony that evokes the best melodic rock across any recent decade or era. With a few exceptions, Red February crafts reasonably catchy, hook-laden, tunes that will resonate with the current generation and those of us who were raised on Eighties rock. Fundamentally, they get that hard rock needs rhythm and groove, and you can move your feet or tap your toe to most every tune. But they also get that current trends require that the riffs be a tad heavier, the bottom end deep. Where lead guitar work has taken a beating in much modern music over the last 20 years, Spohn and company know that a solid solo adds vigor to a song, like dosing your chili with a few extra dashes of Tabasco sauce. Yet one of the best strengths of Red February has to be Cappellazzo's voice. He sings clean, with clarity, passion, and without a monotonous delivery. I'll admit, with the first spin, I was ready to dismiss On The Run as more modern hard rock jibberish, as they sound like everyman's current band. And in some sense they do and will probably have some difficulty rising above the mob of other bands. Alternatively, after another spin or two, you will discover they write good songs that sound pretty darn good, especially with the vocal arrangements and guitar parts, and will likely grab your interest. Check them out. Best picks: More Than Nothing, Back at the Start, Slip Away, Lies. With the strengths of solid vocals, good guitar leads, and simple melody and harmony, Red February makes what could be merely conventional modern hard/heavy rock more interesting and entertaining.